April has already been and gone and what a wonderful month it has been. 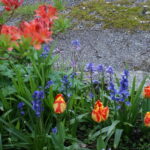 The sun shone, the rain largely stayed away and almost in slow motion the garden blossomed turning green and colourful in front of our eyes. 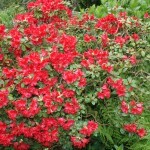 As I write this, in early May, the Azaleas are flowering orange, yellow, red and stunningly beautiful. Bluebells appear all over the garden and woodlands intermingled with a host of spring delights – a rich time of the year and always welcome after winter. I have just seen a Bullfinch in the garden. I was stirring at a reddy orange bud on the branch trying to dicipher its origins when it flew away. The first time I have seen them this year. We have had several pairs in the past but not last year so hopefuly they have had a better winter. During the last few weeks I have enjoyed exploring the locality with Frodo, now 8 months old. We set off down the lane and skip off into the woodland. It is what I like to refer to as a tree graveyard with several large trunks stroon across the pathways. Many are covered in vivid thick moss and some still growing. Frodo loves to jump over and under the branches. It’s a strange yet lovely place. We also wander by the river on a carpet of wild flowers. Natural daffodils in large groups where the first to appear with clumps of primroses. It’s amazing how they got there . Wood anenomes intersperted with bluebells and masses of Golden saxifrage hanging onto the the banks of trickles of waterways. Now Dog’s Mercry is abundant . It has been a magical time to see nature at its best and listen to the River Camel tumbling by. We’ve had and are enjoying a busy time with the cottages mostly with returning guests and a smattering of new ones. It’s always great to catch up with everyone – many we have known for many years. We have a couple here now who first came to old Riverside cottage in September 1998, two months after we arrived here. They were the first guests to stay after we had renovated it. 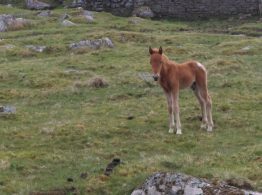 They love the peace and quiet and use it as a time to recharge their batteries before heading North back to their busy lives. 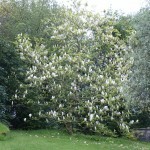 The magnolia tree looking lovely. 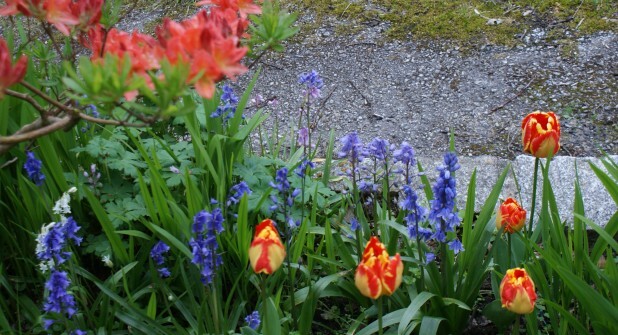 David says as soon as it flowers the wind appears and blows them all away. I think all of our guests headed to Padstow for the Obby Oss celebrations on 1st May. It’s a great day out and although it was rather wet here I am told as the Blue Oss came out the sun began to shine. Its a fun and colourful day. We have another connection with Padstow now as Sebastian has started working for the Rick Stein group. It’s early days but he is enjoying his work and looking forward to the training he will receive – wine tasting, cocktail makiing etc. etc.. He learnt a lot about Whisky in his last job so he’s becoming something of a drinks expert! Well, Saturday morning all the washing is dryed and ironed – very organised this week. We are preparing to go for a long walk on the moor. The sheep are back so we’re training Frodo in distraction techniques – wish us luck. He and I started Agility training last week. He went over all the poles and where he should and he enjoyed the tunnel but he was so excited to see other dogs all he wanted to do was to be with them. I am told he will get better but it’s great fun and it’ll keep me fit and him happy! To all those who have been this year so far thank you – it was really great to see you and for those who are coming we look forward to it. We do have weeks available so if you fancy a break or longer holiday just gives us a call or email.